And what will I be doing there? Oh, you know. Talking and signing books and answering questions and maybe reading something from the upcoming book that no one will have ever heard before. Maybe. We’ll see. Anyway, if you happen to be anywhere near Pickerington, OH on the 18th of March, why don’t you come on down. This is, at the moment, my only scheduled appearance in mid-Ohio for 2015, so if you’d like to see me, you know where I’ll be. 1. If you’re a science fiction writer and you would like maybe to get a little better grounding in some of the “science” portion of that genre, then this is going to be for you: The Schrödinger Sessions: Science for Science Fiction workshop, this summer from July 30 through August 1st. The Schrödinger Sessions is a three-day workshop for science fiction writers offering a “crash course” in modern physics, to be held at the Joint Quantum Institute (JQI), one of the world’s leading research centers for the study of quantum mechanics. We will introduce participants to phenomena like superposition, entanglement, and quantum information through a series of lectures by JQI scientists and tours of JQI laboratories. We hope this will inform and inspire new stories in print, on screen, and in electronic media, that will in turn inspire a broad audience to learn more about the weird and fascinating science of quantum physics and the transformative technologies it enables. Go to the link to find out more. The application form is not up yet but will be, as I understand, in a couple of days. Also, I’ve been asked to note to writers that it’s not just science fiction prose writers who are eligible to attend: Screenwriter and video game writers can also get in on this action. So check it out. 2. If you like Star Trek and/or Doctor Who — which given the demographics of the readership of this site seems like a pretty good chance — you may be interested in this: A Doctor for the Enterprise, a crossover comic book written by 2015 Worldcon Guest of Honor David Gerrold (who is enshrined in Star Trek lore for writing “The Trouble With Tribbles” and other things). Note that this release is a limited edition, so if you want one, you should probably click that link above and get on it right away. I would not want for you to live your life in regret. What’s your electronic data worth to you? What is it worth to others? And what’s the dividing line between your privacy and your convenience? These are questions Bruce Schneier thinks a lot about, and as he shows in Data and Goliath, they are questions which have an impact on where society and technology are going next. 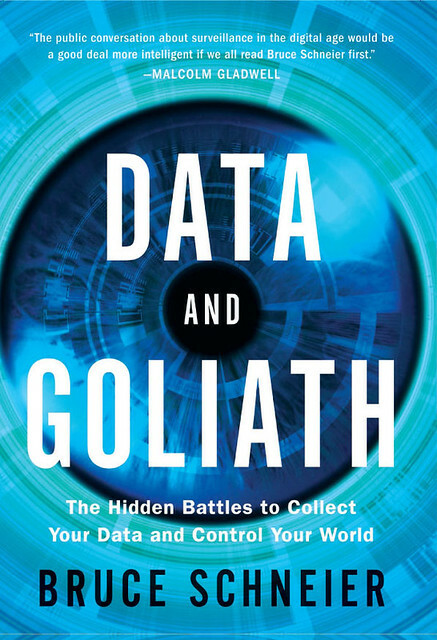 Data and Goliath is a book about surveillance, both government and corporate. It’s an exploration in three parts: what’s happening, why it matters, and what to do about it. This is a big and important issue, and one that I’ve been working on for decades now. We’ve been on a headlong path of more and more surveillance, fueled by fear – or terrorism mostly – on the government side, and convenience on the corporate side. My goal was to step back and say “wait a minute; does any of this make sense?” I’m proud of the book, and hope it will contribute to the debate. But there’s a big idea here too, and that’s the balance between group interest and self-interest. Data about us is individually private, and at the same time valuable to all us collectively. How do we decide between the two? If President Obama tells us that we have to sacrifice the privacy of our data to keep our society safe from terrorism, how do we decide if that’s a good trade-off? If Google and Facebook offer us free services in exchange for allowing them to build intimate dossiers on us, how do know whether to take the deal? There are a lot of these sorts of deals on offer. Waze gives us real-time traffic information, but does it by collecting the location data of everyone using the service. The medical community wants our detailed health data to perform all sorts of health studies and to get early warning of pandemics. The government wants to know all about you to better deliver social services. Google wants to know everything about you for marketing purposes, but will “pay” you with free search, free e-mail, and the like. Again and again, it’s the same trade-off: individual value versus group value. I believe this is the fundamental issue of the information age, and solving it means careful thinking about the specific issues and a moral analysis of how they affect our core values. You can see that in some of the debate today. I know hardened privacy advocates who think it should be a crime for people to withhold their medical data from the pool of information. I know people who are fine with pretty much any corporate surveillance but want to prohibit all government surveillance, and others who advocate the exact opposite. When possible, we need to figure out how to get the best of both: how to design systems that make use of our data collectively to benefit society as a whole, while at the same time protecting people individually. That’s it; that’s our big challenge. Some of our data is best shared with others. Some it can be “processed” – anonymized, maybe – before reuse. Some of it needs to be disposed of properly, either immediately or after a time. And some of it should be saved forever. Knowing what data goes where is a balancing act between group and self-interest, a trade-off that will continually change as technology changes, and one that we will be debating for decades to come. Read an excerpt. Visit the author’s Web site. Follow him on Twitter.